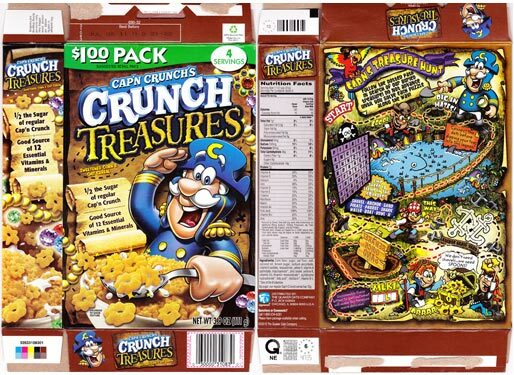 Cap'n Crunch's Crunch Treasures Cereal is basically regular Cap'n Crunch with 1/2 the sugar, 1/2-sized pieces... and unfortunately 1/2 the magic. For better or worse, some cereal were meant to have a lot of sugar. Original Cap'n Crunch has been around since 1963. The appeal of the Cap'n character aside, the cereal would not have lasted some 50 years if it didn't taste good. When you remove 1/2 the sugar, you remove 1/2 the taste. I'm all for reducing sugar in cereals, but sometimes it just doesn't work. This is one of those times. Nutritional Considerations: Each 1 and 1/2 cup serving has 120 calories, 1 gram total fat (0.5 saturated and 0 trans). 26 grams total carbs, 1 gram dietary fiber, 6 grams sugars and 2 grams protein. 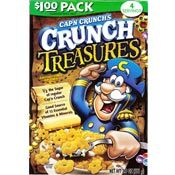 What do you think of Crunch Treasures? Just not as good as the real thing. I think they know that and that's why it's so cheap. I found some at the 99 Cent store. That usually means a product is being discontinued. I don't like it as much as regular Cap'n Crunch. It has less sugar, but I wanted to add sugar... so it doesn't really make sense to buy it. The thing to do is mix it with regular Cap'n Crunch, then you will cut back on your sugar intake (somewhat) and it will still taste great. This stuff is good! I don't know why it gets a bad rap on some other sites. Is it the same as King Vitaman, which I haven't had in a long time and used to like a lot? As a nutritionist, something seems weird with the nutritional info on the box. In the 3.9 ounce box, it says there are 4 servings (each 1.5 cups) but the boxes that I got have less than 4 cups in them. Also, it says that a 1.5 cup serving has 31 grams but my diet scale says it's 45 grams. I suspect that a serving size should be 1 cup, not 1.5 cups. This cereal is actually GOOD and that's coming from someone who grew up eating original Cap'n Crunch. Bravo to Quaker Oats for trying a 1/2-sugar formula. I must say that I love Cinnamon Toast Crunch way better then this cereal. I mean sure this isn't bad but it is absolutely nothing compared to that delicious Cinnamon Toast Crunch. Captain' out. Hmmm... I thought it was rather good, really. But then, I'd never eaten regular Captain Crunch before.